We were up pretty early and had a little bit of room service for breakfast so we could be off for our extra early hour inside the park. 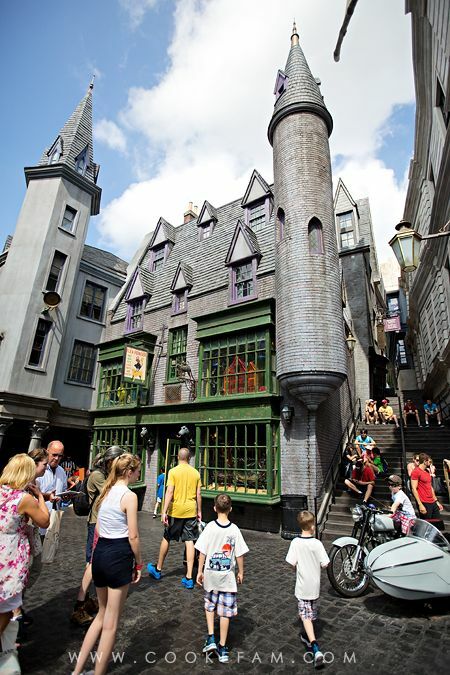 If you stay on property at Universal, you get to go into the Islands of Adventure to The Wizarding World of Harry Potter an hour before the park opens. 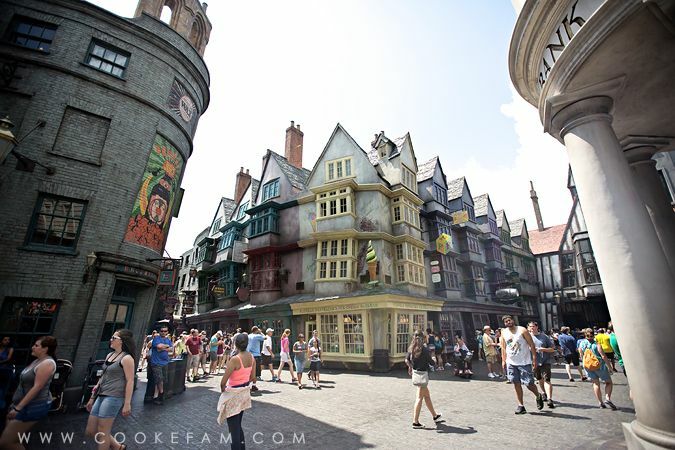 First, a little back story on how we ended up at the Wizarding World in the first place. 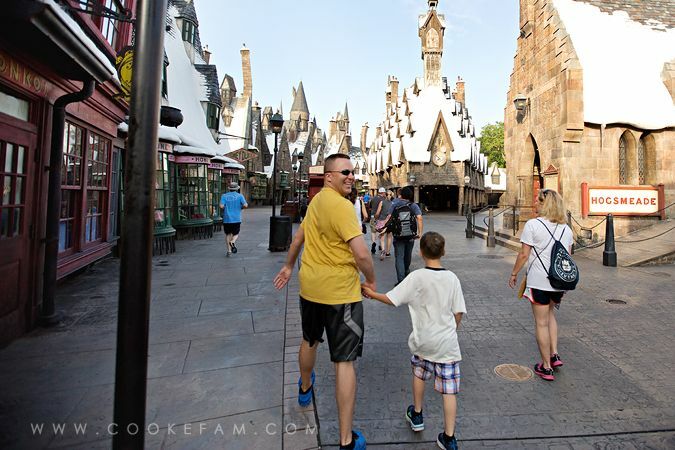 When I booked our cruise a year ago, it didn't even occur to me to visit the Wizarding World because I thought the kids were too young to enjoy it. 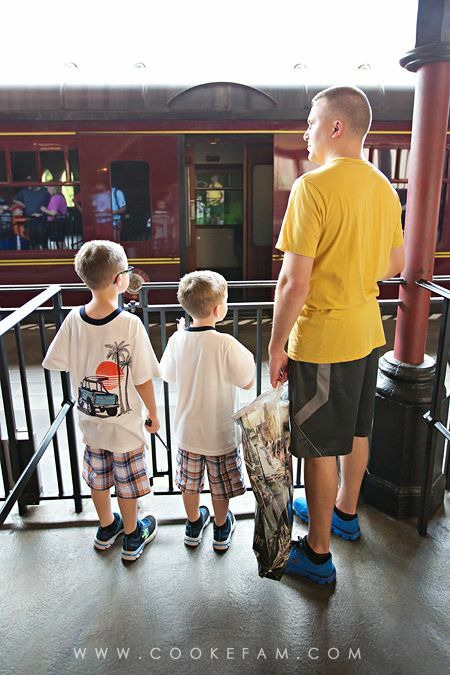 And I didn't want to just do ONE day of Disney with them for their first visit to Disney World. So, we were going to head straight out to Cape Canaveral (where the cruise departs from) and hang out there for a day before our cruise left. I planned on having us visit the Kennedy Space Center, which is nearby. Well, during the space of a year, we had read the first two Harry Potter books together, and 1/3 of the third book, and the boys asked for a bunch of Harry Potter stuff for Christmas. In short, they were hooked, and I re-thought our plans. 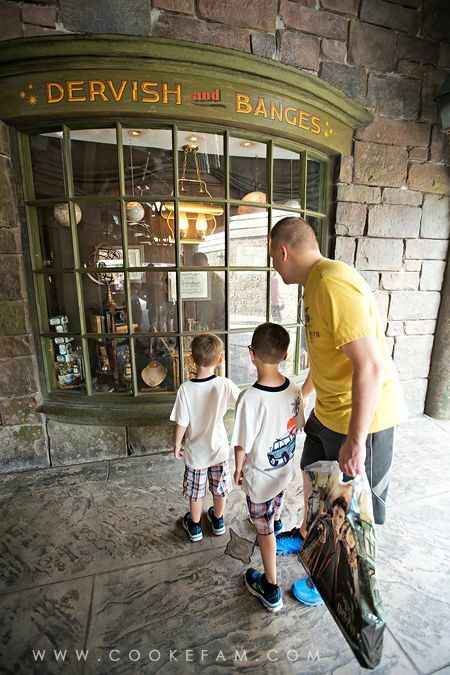 I knew they were still too young for a few of the rides, but I had heard the Wizarding World is an experience in and of itself even without the rides (which is absolutely true). And I knew we could visit with them again in a few years. 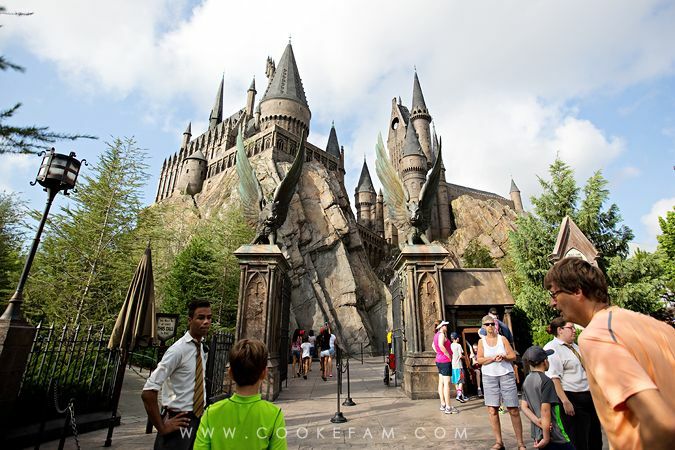 So, a few weeks before our trip, I rearranged some reservations, bought Universal park tickets, and made those Hogwarts letters. 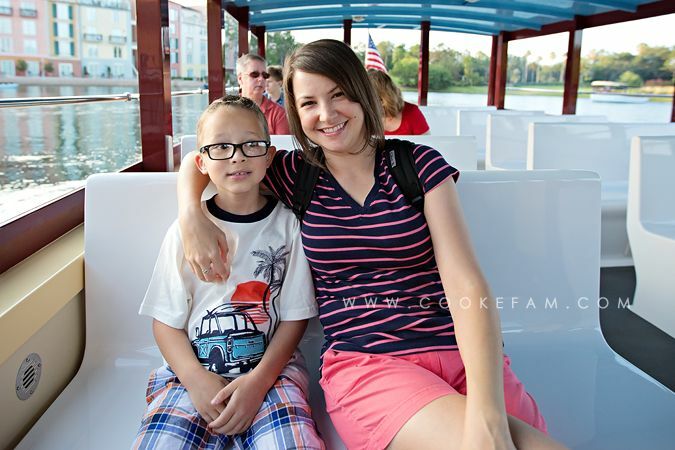 We hopped right on the very convenient and easy water taxi at our hotel and headed to the park entrance. I loved the water taxis. Brilliant. 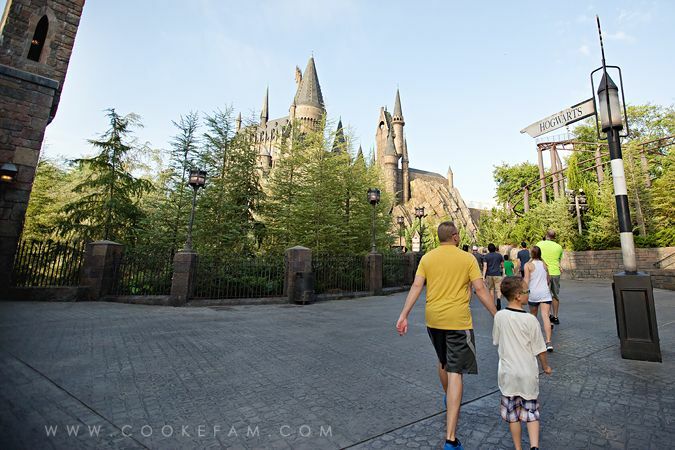 When we got to Islands of Adventure, we waited about 10 minutes for the gates to open and then we followed people back to the Wizarding World of Harry Potter - the only part of the park that opens early. 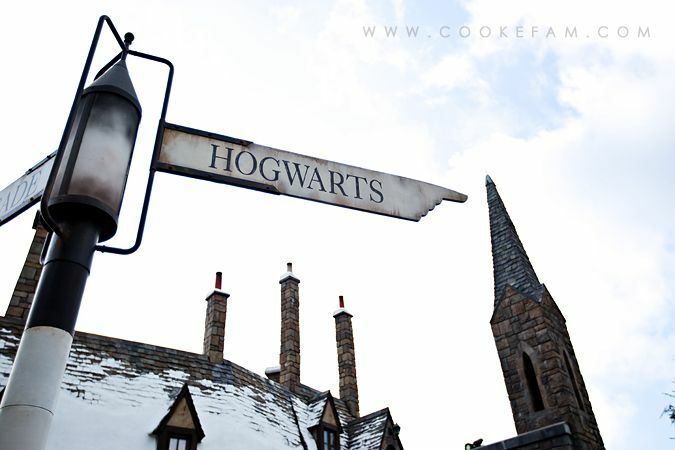 Specifically, Hogsmeade and Hogwarts. We were walking briskly, but not running. It didn't feel like a stampede anyway. 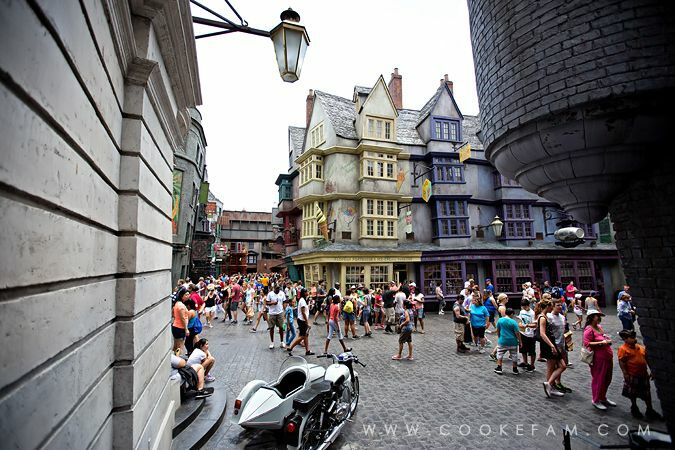 But everyone was headed to the same thing...The Forbidden Journey ride, which can have very long lines as the day progresses. SO, I did not get to stop to take any photos other than those I could snap along the way! Lots of Ethan and Casey walking in front of me. Logan was beside me. 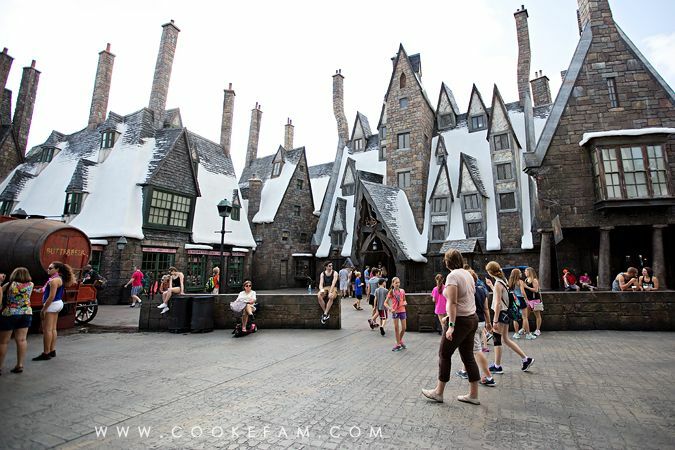 We were all enthralled with Hogsmeade as we passed through to the ride. We planned on revisiting this area after we rode. And our first glimpse of Hogwarts. The boys faces lit up with smiles. Mine too. It was so cool. All of it. And straight out of the movie. 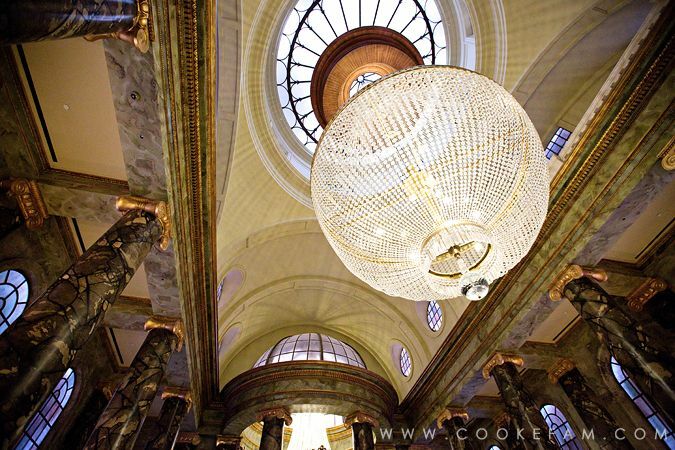 We hadn't stopped to notice any of the infinite details all around, but we could already tell this place was awesome. 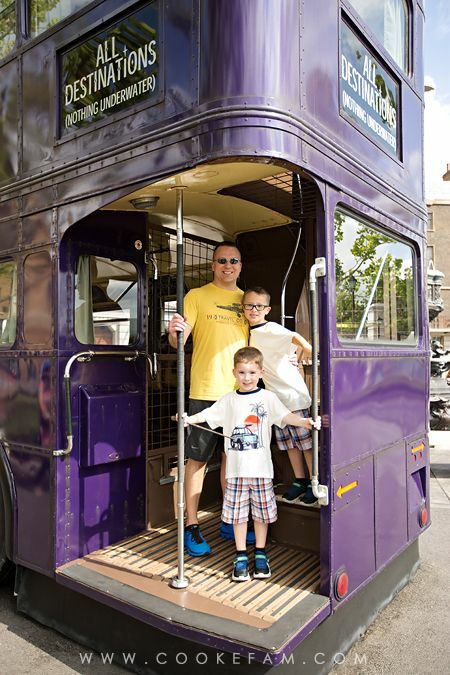 Logan was too short to ride The Forbidden Journey, and we decided not to let Ethan ride either so it would be fair. And after riding, I think Ethan would have been very scared of it anyway, so that was a good decision for us. And because of that, we went in line with the plan to do the child swap. So, I was allowed to take my big camera into line. Normally I'd have had to stow it in a locker because you can't have anything with you on the ride. 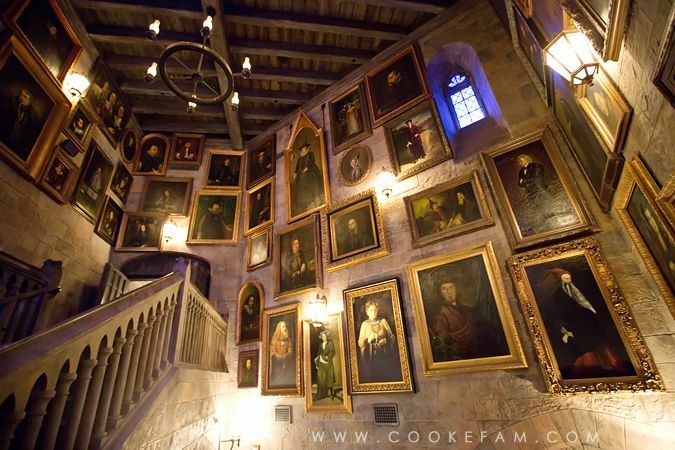 And let's just say...the inside of Hogwarts is nothing short of amazing and photo-worthy. Although, my photos are all grainy and blurry since it is DARK in there and obviously I didn't have a tripod...or family who would wait for me to take photos either! Here's the mirror of Erised. 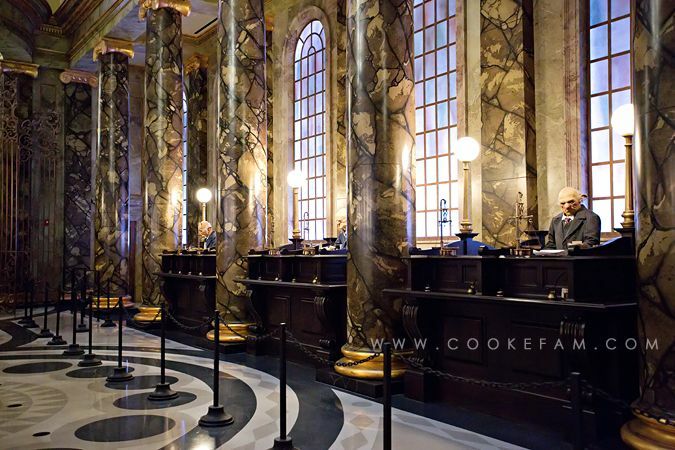 The details make you feel like you really are inside Hogwarts. It's crazy. And we loved it. 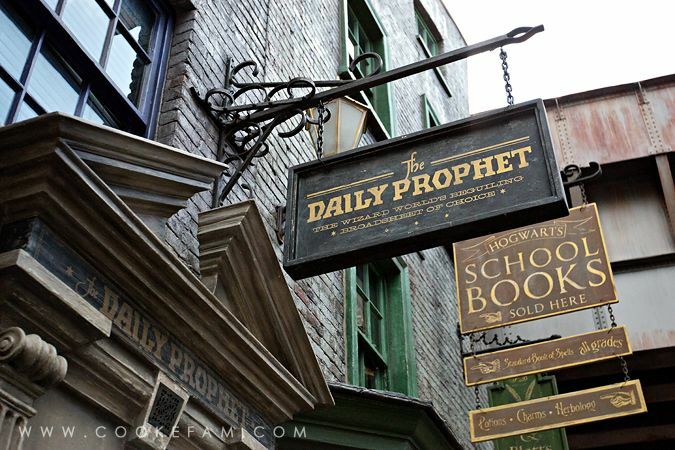 Here's the Defense Against the Dark Arts classroom. We moved through the line quickly, so we didn't linger to look or take photos long. Our mission was to ride the ride. 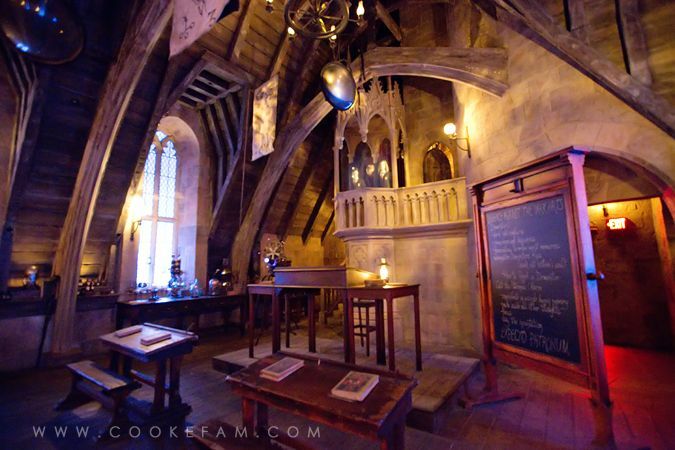 But we did have a plan to savor the inside of Hogwarts after. 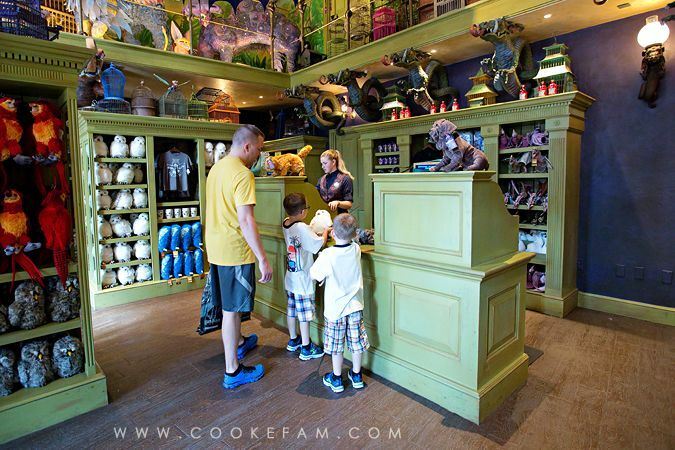 Filch's Emporium is a store into which you exit right after the ride. 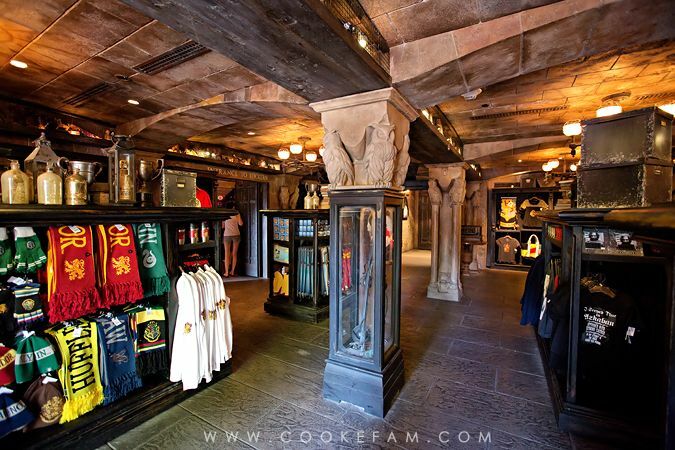 It's pretty cool and has some fun artifacts from the books and movies inside in addition to the merchandise. The ride itself was awesome. One of my favorite rides ever. 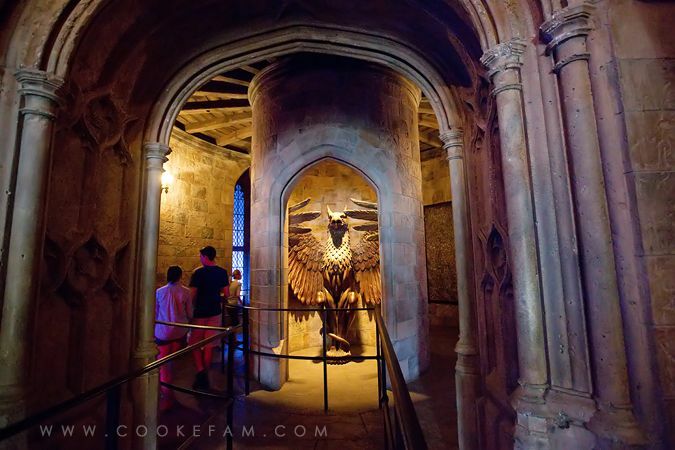 Because I had researched the Wizarding World online before we went, I knew that we could tour Hogwarts in a separate line from the riders. So, after basically walking onto the ride first thing, we circled back around and asked the line attendants where to go for the tour line. And there was no one in the tour line. 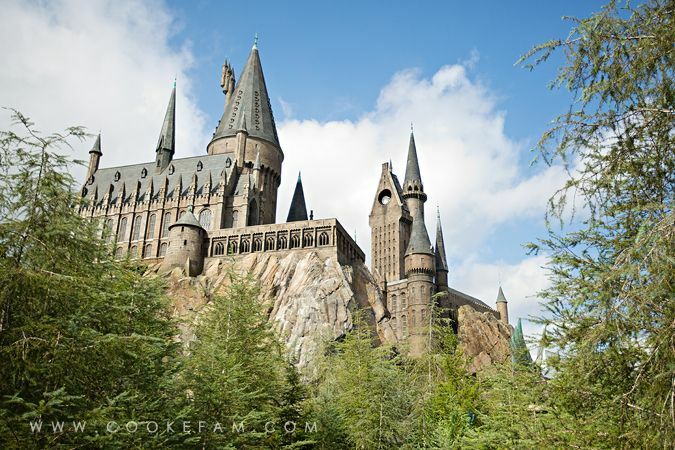 You walk the inside of Hogwarts at your own pace. And the cool thing is, you get to hear the back story to the ride now that you can take your time. Some of the portraits talk...and those that do are setting up what's about to happen on the ride. 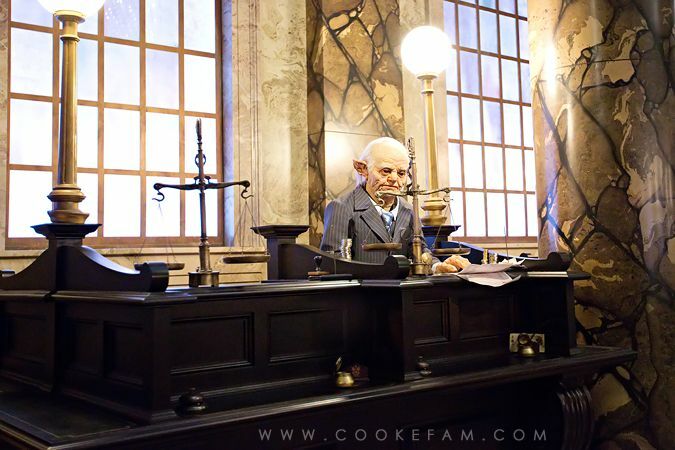 Here is Dumbledore's office. He's telling us a bit of the back story as well. I'm so glad we did the tour line after the ride. 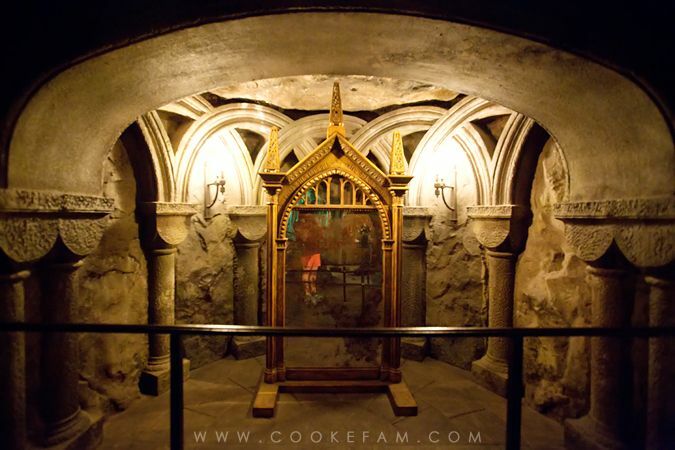 We really got to see the inside of the castle, which is not to be missed...and take our time doing it. 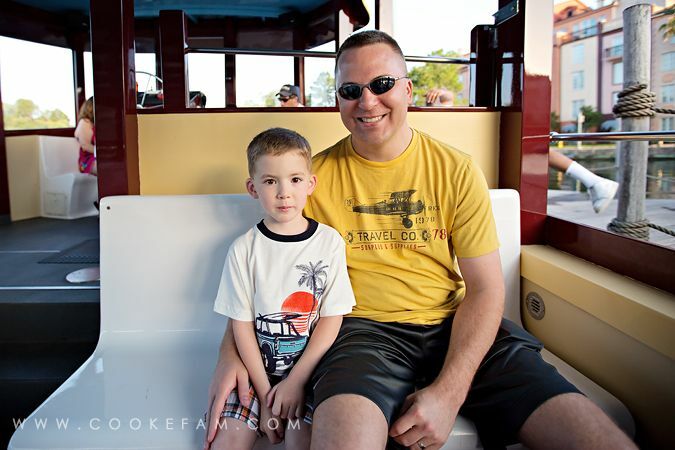 Plus, this was the part of the ride that the boys were able to enjoy this time. After that, we went over to the Flight of the Hippogriff ride. The boys didn't know what a Hippogriff was yet...since we hadn't gotten to that part of the 3rd book yet. But they still thought it was cool. 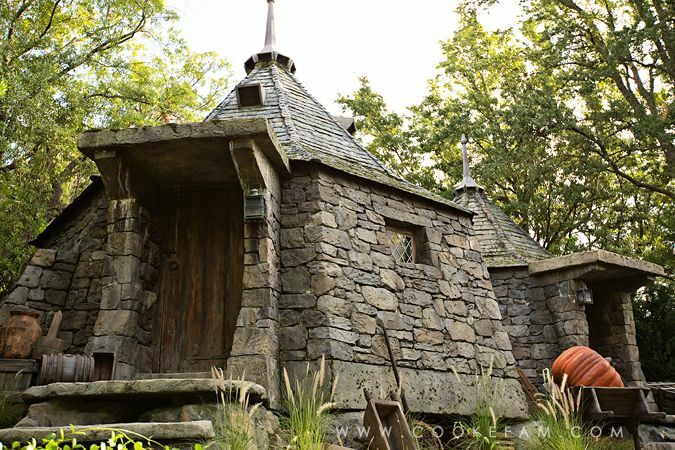 And in line, we got to see Hagrid's hut, which they did recognize. 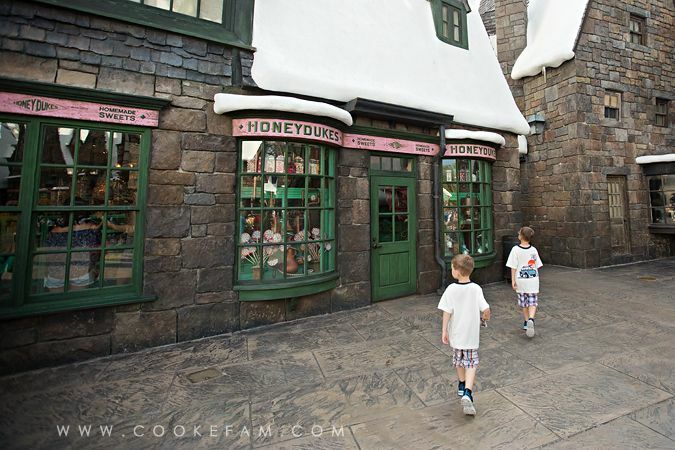 We took our time after that...just looking around Hogsmeade. 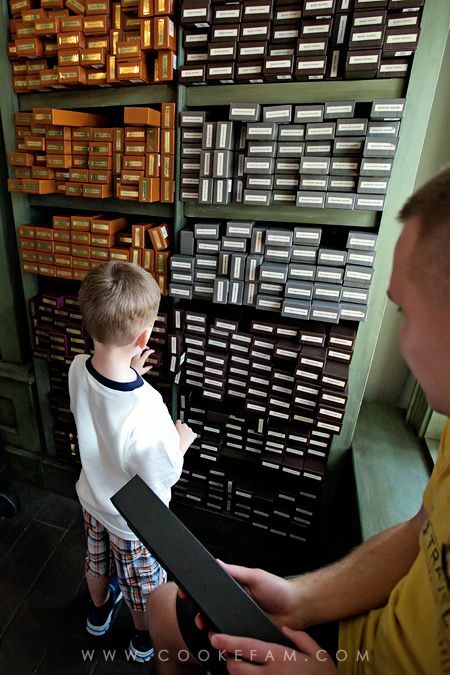 Buying wands and other souvenirs. Logan got Ron's wand, Ethan got Harry's, and Casey got Dumbledore's. I didn't get a wand (this time). It was still not too busy here...yet. I loved all the crooked buildings and chimneys. And the fake snow. 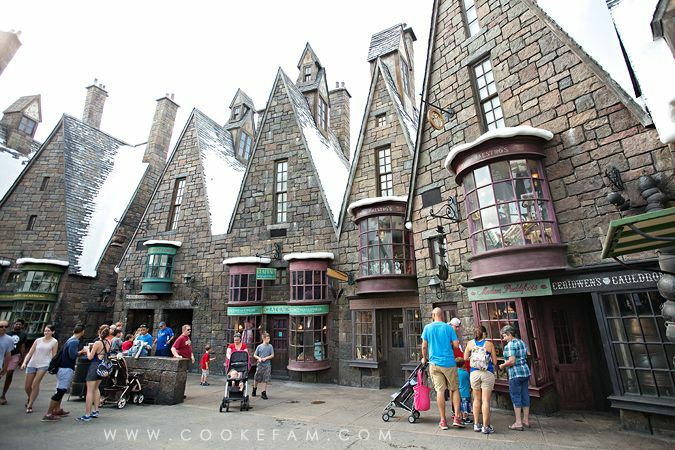 It looked exactly like Hogsmeade. 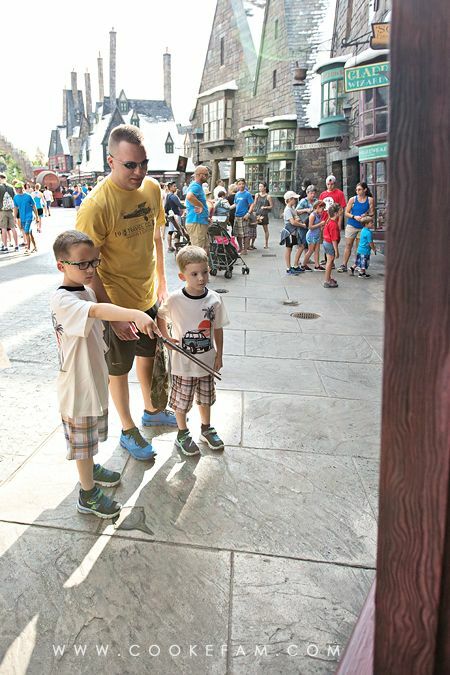 We bought the boys the interactive wands, which allowed them to perform magic spells all over Hogsmeade and later, Diagon Alley. It was SO cool. 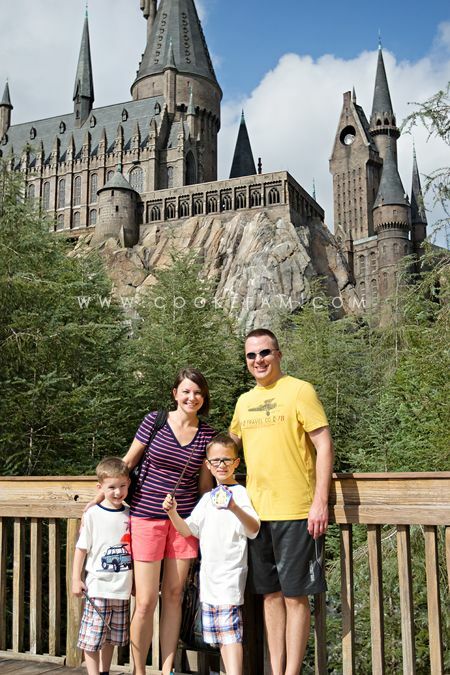 The wands are a little more expensive than just the plain ones, but it was so worth the few extra dollars. The boys loved doing magic! Every single window has got fun stuff in it. 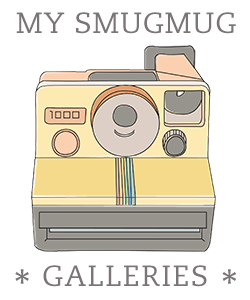 Most of these are just store fronts and not actual stores, but they are still really neat. We explored them all. 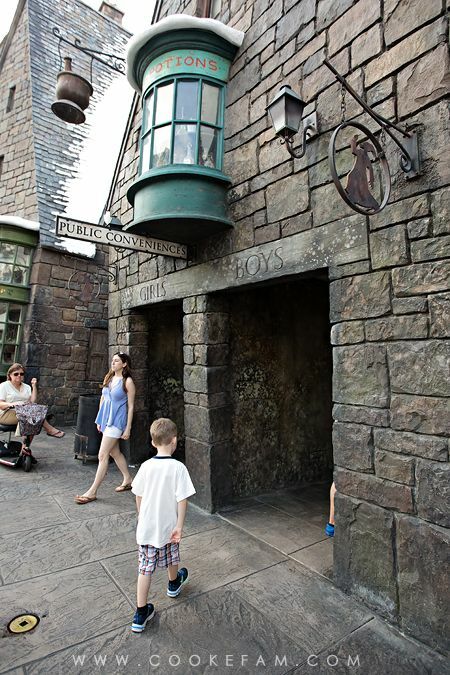 Another fun thing that I had read about beforehand were the bathrooms (or "public conveniences") in Hogsmeade. 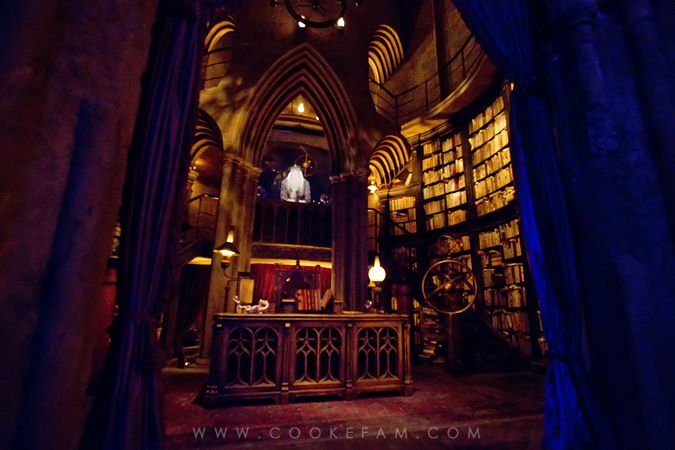 Inside (even the men's) you could hear Moaning Myrtle. We found a quiet spot around the back side of the Hog's Head with a great view of the castle. Then we made our way to Honeyduke's. 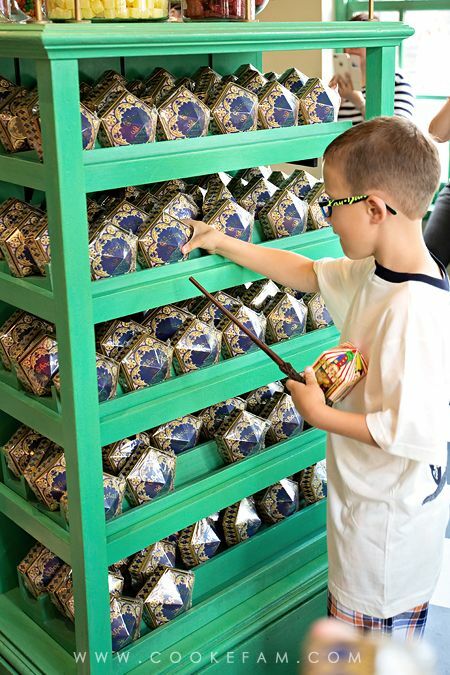 I think it took Ethan all of .2 seconds to spot the Chocolate Frogs. Of course, they each got one. 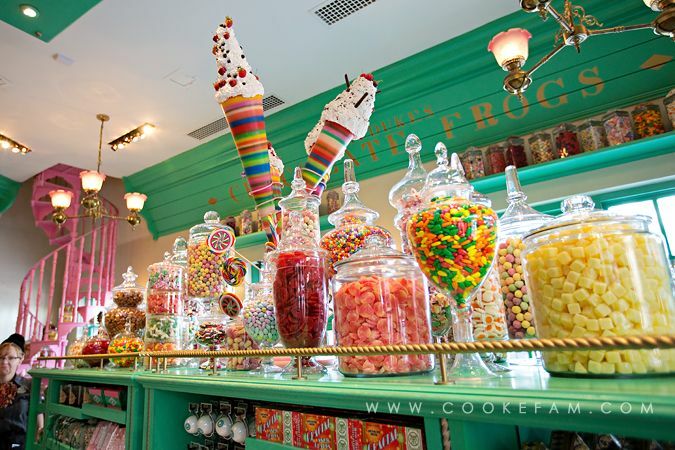 And a box of Bertie Bott's Every Flavor Beans. 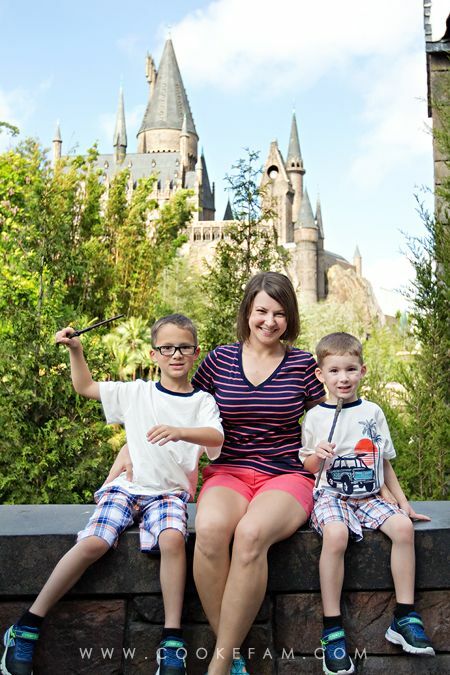 They absolutely could not wait to tear into their chocolate frogs and jelly beans, so the boys and I found a spot to rest while Casey went to ride the Dueling Dragons roller coaster (neither of the boys could ride it). 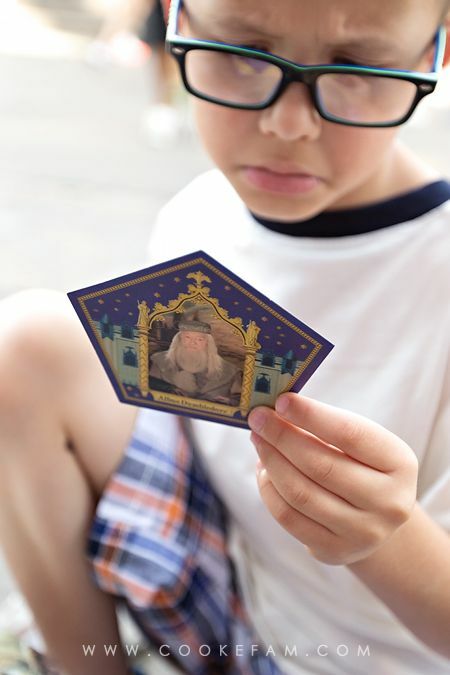 Ethan got Dumbledore on his chocolate frog card. He was really excited...here he's frowning because he's trying to read the text on the back! Logan got Rowena Ravenclaw. 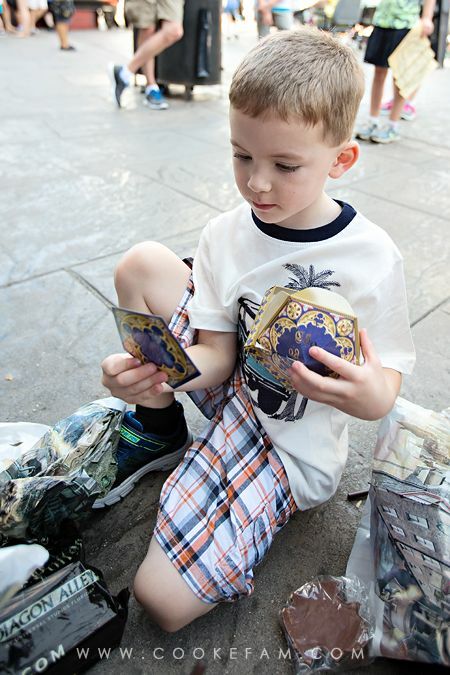 He was excited because it was his first card, but he would have preferred to get Slytherin. 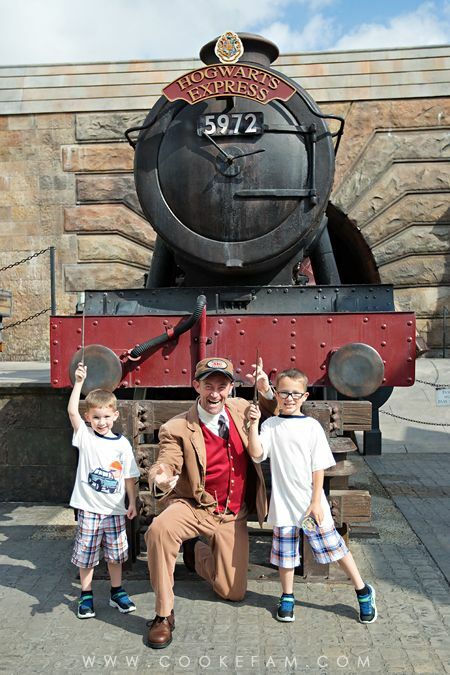 Just across the way from us was the Hogwarts Express and the conductor. 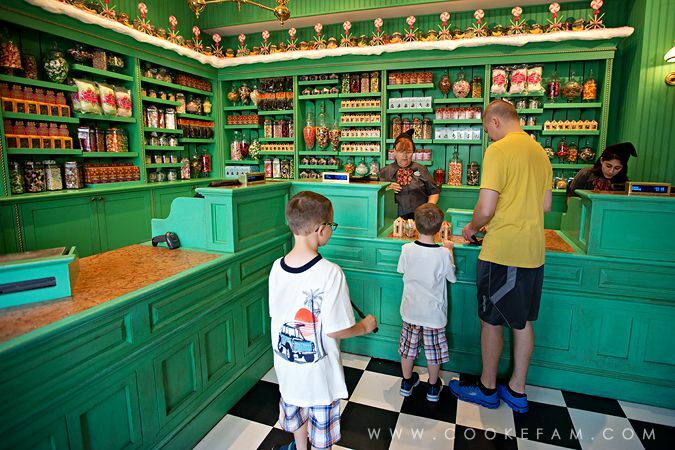 So after the boys finished their chocolate frogs, we went over there for a photo. And luckily, we had just finished that when Casey was done with his ride. 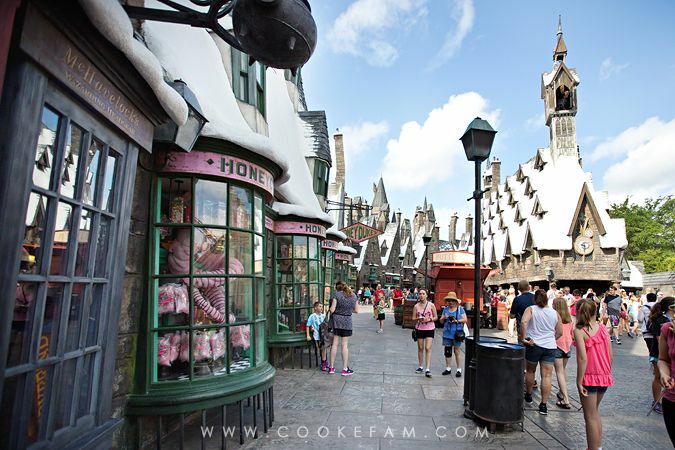 There's a bridge that connects Hogsmeade to the Jurrasic Park part of Islands of Adventure. It's a great place to get a shot of the castle. A very nice person offered to take our photo after I took one of his family. I love that we are all in this one together, but it also illustrates how these never turn out quite right. We are out of focus, but the castle behind us is IN focus. And also, the top of the castle and our feet are chopped off. He took this photo horizontally and I cropped it vertically because there were other groups of people on either side of us. I should have asked him to take it vertically, and I should have put the camera in auto to help with the focusing. Sometimes that doesn't even matter (I've tried). Oh, well. 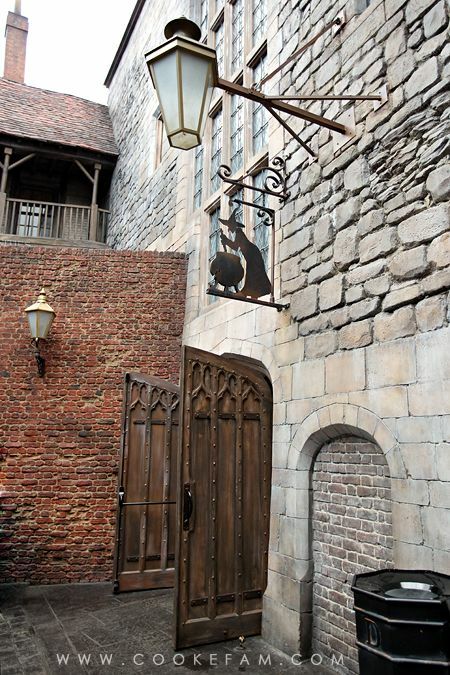 On the way out of Hogsmeade, I was able to stop and take a photo of the entrance we had passed on our way in earlier that morning. 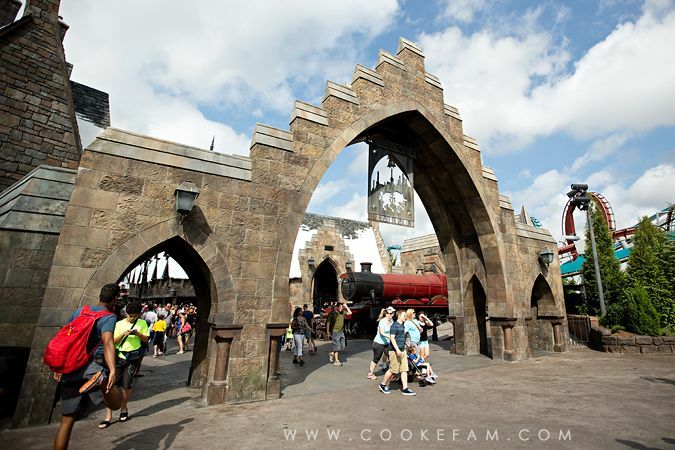 When you approach it, you see this archway and you start to hear the Harry Potter theme music...there's nothing like it, I tell you. We got in line for the Hogwarts Express that would take us over to Diagon Alley in Universal Studios. You have to ride the train both ways, by the way. The ride is different each way. This was something I learned in my online research and I'm so glad we knew about it. We were some of the first ones on the train that morning and they gave us our own cabin. Blurry photos again because of the lighting and my lack of a tripod, but I'm glad I have them just the same. 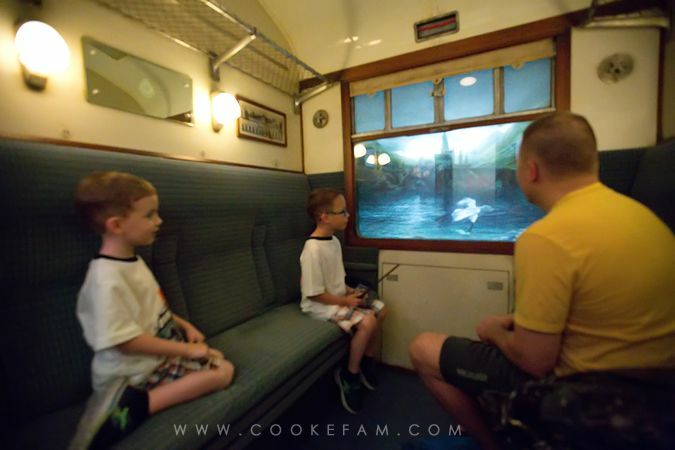 It looked exactly like the inside of the Hogwarts Express and the boys were enthralled. And the ride itself was SO cool. 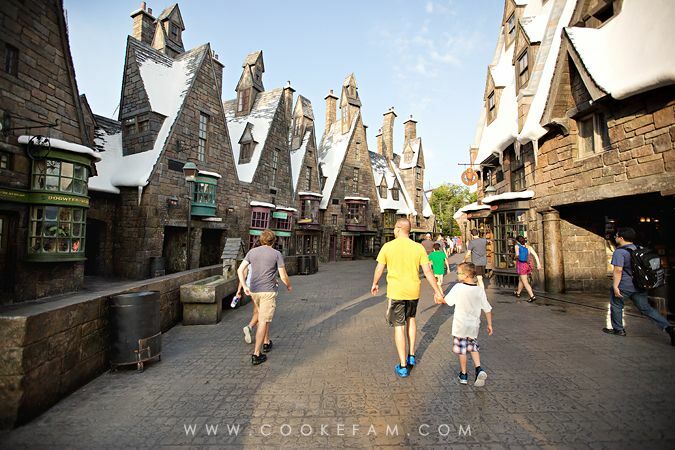 We saw the countryside change from the magical Hogwarts into the Muggle London. 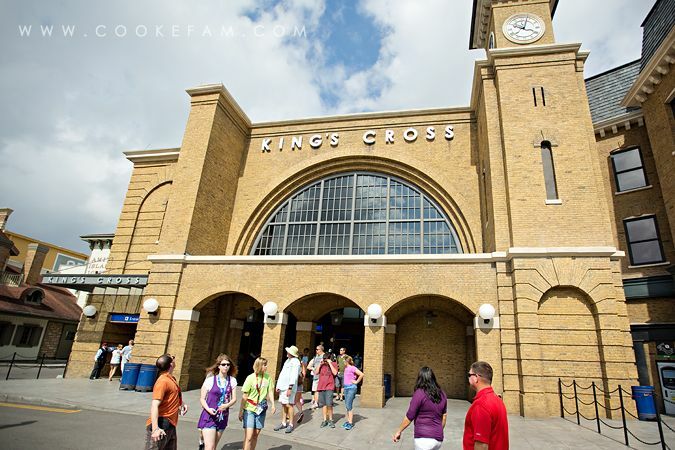 We came out of King's Cross station onto the streets of London at the back side of Universal Studios. 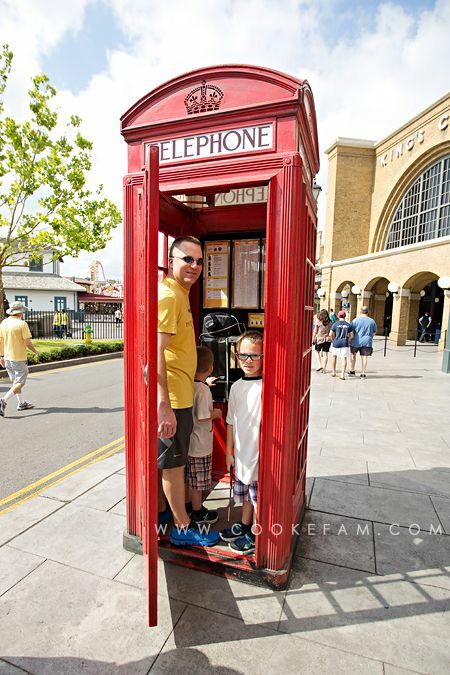 The phone inside this phone booth allows you to dial the Ministry of Magic. Another tip I had picked up from the internet. But, the boys didn't want to stop long enough to try it! 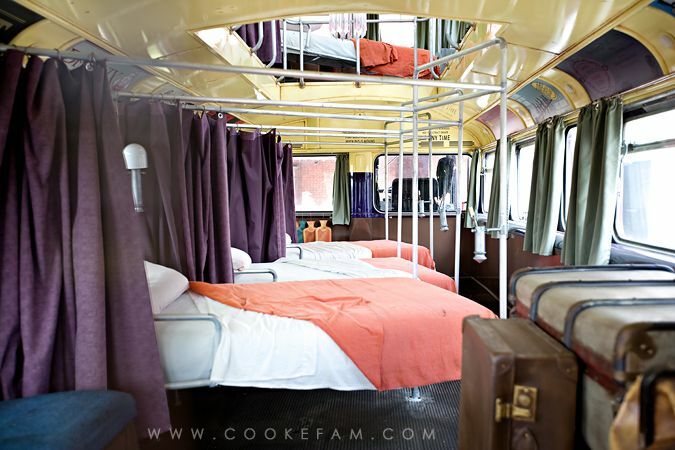 And the inside of the bus. You can see the very tip end of the chandelier that is hanging down all the way from the third floor of the bus. 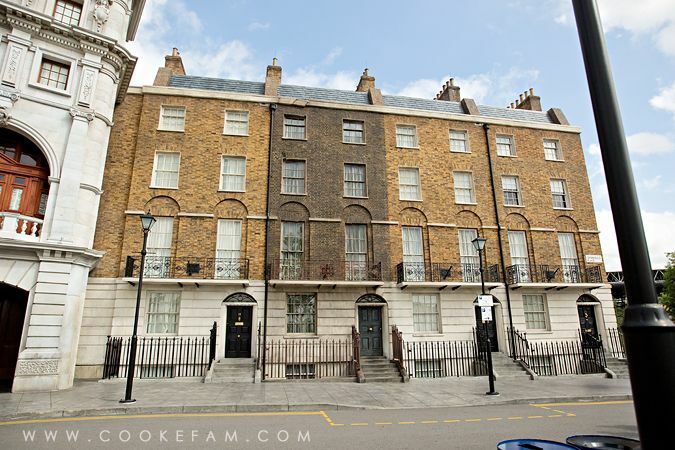 Across the plaza is a row of London Homes, which just happens to be a familiar street...Grimauld Place. And the darker brown one is #12...complete with Kreacher looking down on you from one of the windows every few minutes. And then, after passing through the brick wall (just like the movie! 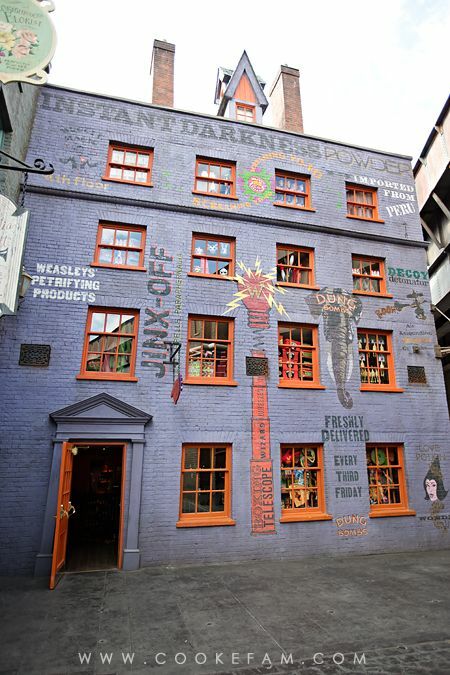 ), we were in Diagon Alley! 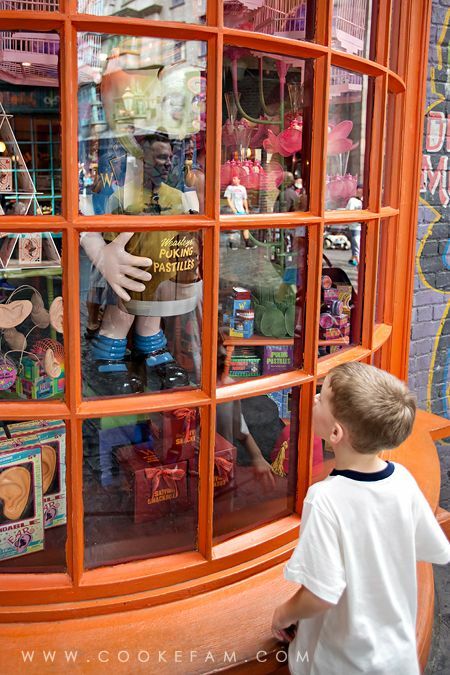 Just like in Hogsmeade, ALL the windows are fascinating. And there are a lot more shops here that are actually shops. 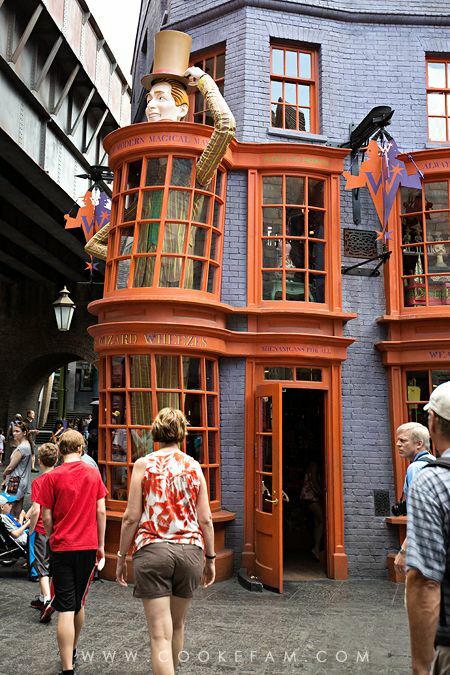 The side of Weasley's Wizard Wheezes. And the front of it...straight out of the movie. It really was incredible to feel like you were plunked down right smack in the middle of the movie set. 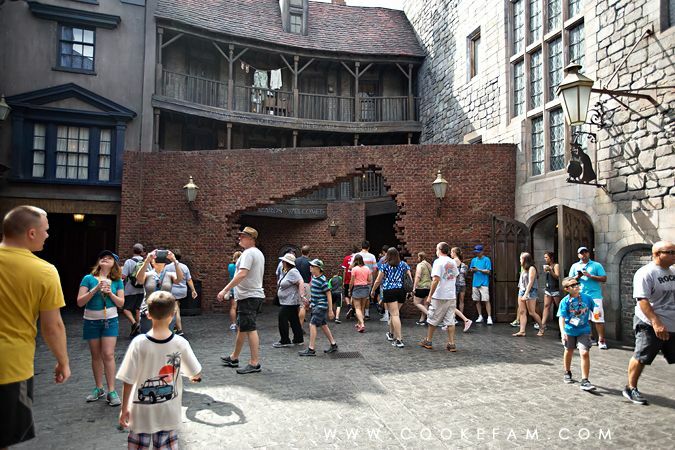 The exit of the Leaky Cauldron, where we would eat lunch later. 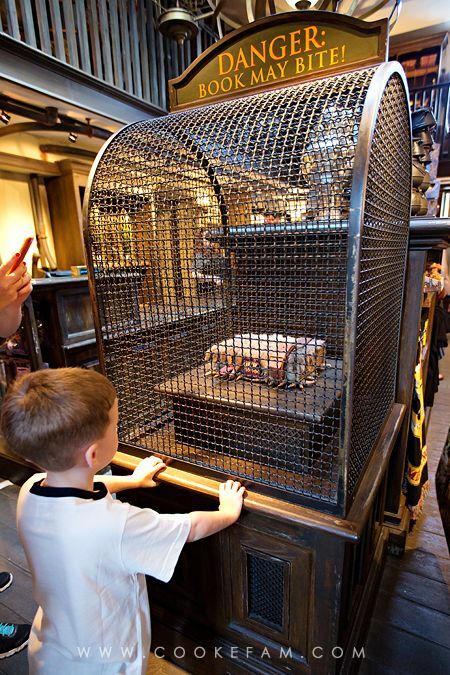 The boys practically made a beeline toward the Magical Menagerie when they spotted it. They knew that there were stuffed animals to be bought inside. They each got an owl. Ethan got Hedwig and Logan got Pigwidgeon. They loved that the owl's heads turned all the way around like in real life. 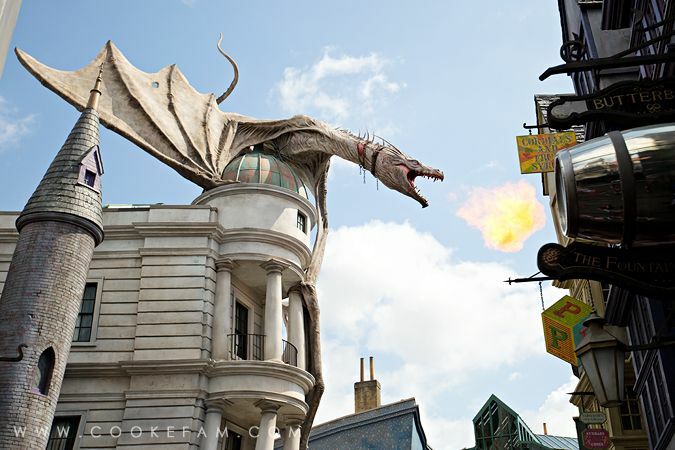 The fire-breathing dragon on top of Gringott's will startle you if you're not ready for it. It always growls a bit before it breathes fire, so we started listening for that. Pretty cool, though. 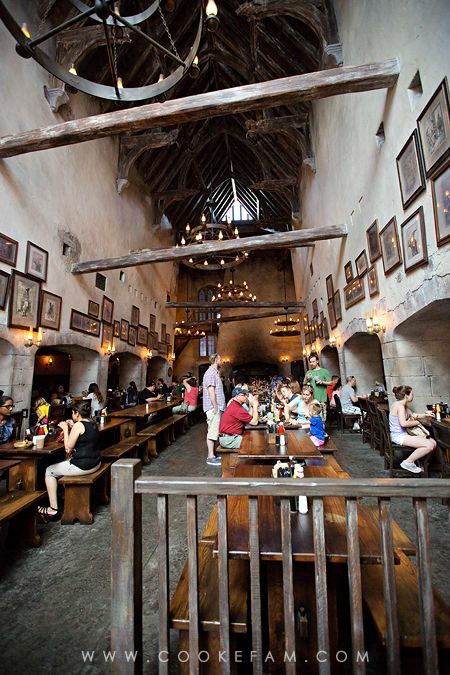 We were getting hungry, so with our magical owls in tow, we went to the Leaky Cauldron for lunch. I love this place and the traditional pub food they offer. 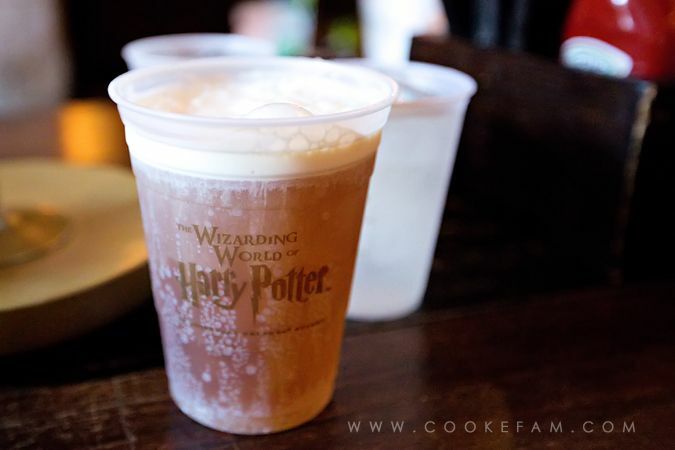 And I absolutely loved the Butterbeer. We got both the frozen and the regular to try. The boys passed on both variations, but I loved them both. My favorite was the regular, though. We opted to get our Butterbeer inside the restaurant because all of the carts outside that sold them had really long lines. For lunch, Casey got the fish and chips and I got the Cottage Pie. We thought both were really good...especially since they were theme park food. Really quite good. Both boys got mac n' cheese, I believe...and ate all of it. 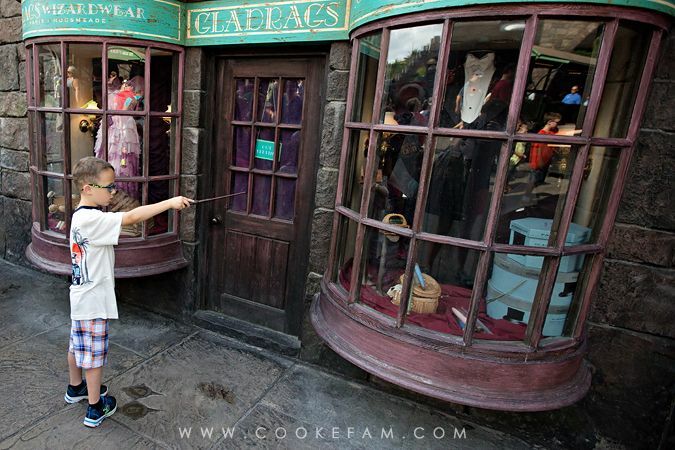 Back out on Diagon Alley, we perused all the stores and Casey got some ice cream at Florian Fortescue's. 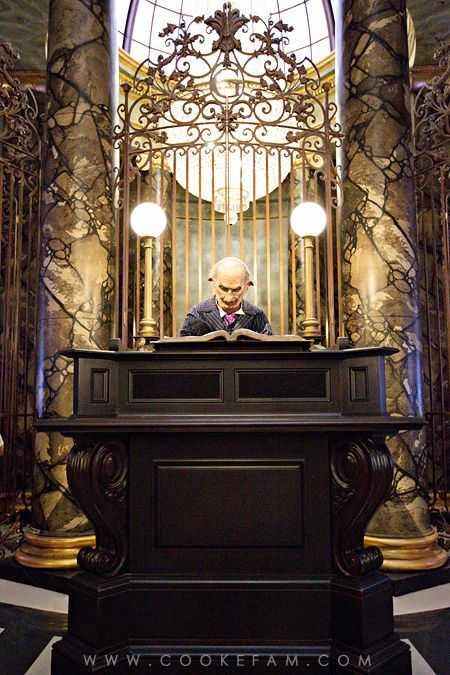 We also rode the Escape From Gringott's ride. We all rode it, but we did child swap just in case one of them decided not to do it. And that allowed me to bring in my big camera again. Inside the line, there were bits of the story along the way. 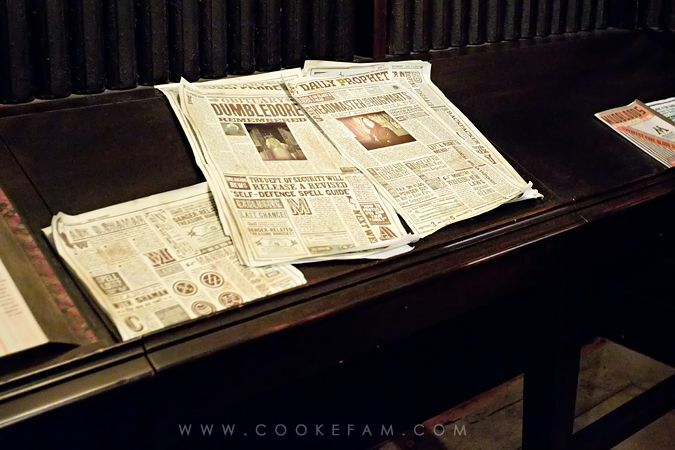 And these magical newspapers even had moving photos. The ride was a little bit scary for both of the boys - mostly because they didn't know what was coming - but they did end up liking it. Casey and I loved it. 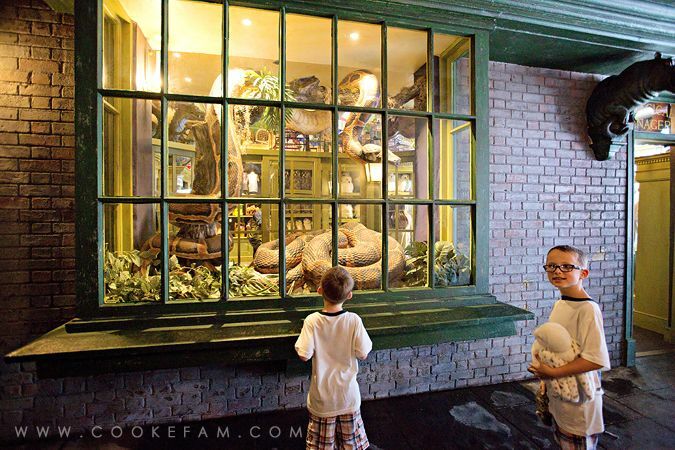 We took one last look around Diagon Alley after the ride and were glad we did...we spotted this side alley where Nagini was in the window. He talked to us as well. 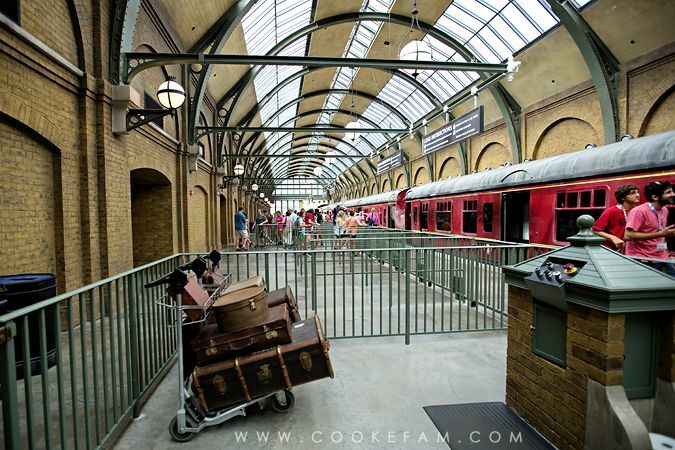 Then, we rode the Hogwarts Express back to Hogwarts and exited the park. We were exhausted with our fun day. We didn't even hardly look at the rest of the Universal parks! We went back to the hotel and all rested for the latter part of the afternoon before dinner, which we ate at the hotel. This was such a fun day and everything I expected it to be (except I could have done without the massive crowds as the day progressed). The next day, we would be off to Cape Canaveral...and our cruise!